Protecting your license and your right to practice in the state of Texas – which is dictated by state law, not federal law. Monitoring issues that affect your job, licensure, reimbursement and quality of service. Being your voice at the Texas Capitol, advocating to lawmakers and state agencies. Offering support including legislative advocacy, monitoring state licensure rules and regulatory agencies on your behalf. 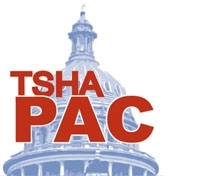 What is the TSHA PAC? The TSHA PAC is a group that bands together under a unified mission to support candidates for public office. Operating as a non-profit, unincorporated and non-partisan group, the TSHA PAC receives and distributes contributions to election campaigns. A PAC can only solicit contributions from individuals associated with a specific organization/association and all contributions are strictly voluntary. What is the TSHA PAC Mission? Our mission is to support candidates for state office whose records and policy positions demonstrate an understanding of the importance of speech-language pathology and audiology professionals and supports legislative efforts to maintain access to high quality services for our consumers. Why is the TSHA PAC Important? Bi-annually in Texas, legislation is enacted that impacts the practice of our professions and may affect access to high quality services for individuals with speech, language and hearing disorders. TSHA PAC provides financial support through campaign donations to legislators who are in a position to assist our professions and our consumers. How Much Money Can I Give to the TSHA PAC? The TSHA PAC can accept cash contributions up to $100. There is no limit to a contribution made by check or credit card. All contributions to the TSHA PAC must be given from personal funds. No corporate contributions are accepted. Why Should You Participate in the TSHA PAC? The cost of maintaining a strong legislative presence in Austin continues to rise. The Texas Speech-Language-Hearing Association Political Action Committee (TSHA PAC) needs your financial support. The purpose of the TSHA PAC is to encourage the support of legislation which addresses the needs of the professions in all work settings. The PAC raises money for contributions to candidates for state office who are supportive of TSHA’s legislative goals. It is an effective way to ensure that our voices are heard. By donating money to the PAC each year, you can help us gain access to decision makers during the legislative session so we can inform the legislators of the importance of our professions and the necessity of maintaining the highest professional standards to ensure that our consumers receive quality services. You can support the TSHA PAC by contributing money, volunteering your time and helping share the mission of TSHA and the TSHA PAC. Contribute, advocate, and support our professions! How does the TSHA PAC determine who to support?